Our Senior Care Coordinator in our Bournemouth and Poole Home Care Office has featured in a national Government campaign to attract people to the care sector. “It’s a busy, fast-paced role, and it keeps you on your toes, because every day is different!” Sharna joined Good Oaks five years ago as a Home Carer, working her way up to become a Team Leader, then on to Care Coordinator, and Senior Care Coordinator. A typical working day for Sharna would be arranging and attending assessments, working with clients to put together care plans, and dealing with enquiries. She also supports her Team Leaders to manage their team of carers. 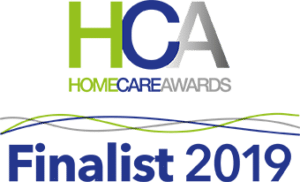 Sharna and the rest of the home care team have earned a place in the finals of the 2019 Home Care Awards in the category of Recruitment and Training. Recruitment and Training are vital in supporting quality care, ensuring we have the best carers, and they are trained and supported to do the best job they can do. There are many opportunities for progression and career development in adult social care. To find out how you can build on your skills and learn new ones, visit www.everydayisdifferent.com or check out our vacancies here: home care jobs.